Inside the main auditorium the band are on a well earned break. 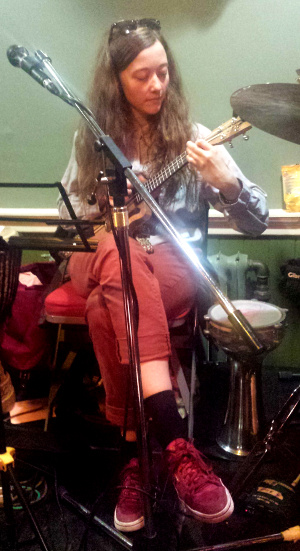 Sitting on her stool and plucking at an electric ukulele is Jenny Hibberd. The notes rings out and fill the air with harmonics. She is doing what musicians might call “noodling”. It sounded fantastic. Electric uke is not her only instrument. Depending on what is required she can also be found on a djemba djembii a drum and a daboka darboka another drum or even singing. One thing we have to ask is how is this band who were thrown together yesterday able to sound so good? “I think the fact is, all the people surrounding me are incredibly talented and I just slot in the cracks.” She gives an infectious laugh. I mention the multitude of instruments on the stage. Today the change overs aren’t too bad. Yesterday there was some very quick changes between a drum and another drum. I mention Dave on drums who at one point was playing accoustic guitar and drums at the same time. “That is because he is a don. Dave the don.” She gives another infectious laugh. You get the feeling these laughs are helping anyone around her when the going gets tough. But how did she find herself here? “Last time I was asked to be a writer which I did and it was fun. I remember watching the band and thinking ‘I want to do that’. So for the next round I said I wanted to be in the band or be an actor because I wanted to be involved in the hubhub. I really enjoyed the writing but I wanted to enjoy the buzz of being in the festival in the day.” There is no doubt, as she sits in the centre of the bands riser she has her wish. I assume she’s talking about the festival. But she could be talking about the band. Either is accurate.